Considering human and environmental health in building code development. Allowing the elimination of toxic flame retardants when shown, with testing, that fire safety can be achieved through other means. Marjorie Smith, a Senior Associate at Siegel & Strain Architects, has been writing proposals, participating in working groups, and testifying at hearings since 2014 with the Green Science Policy Institute team. 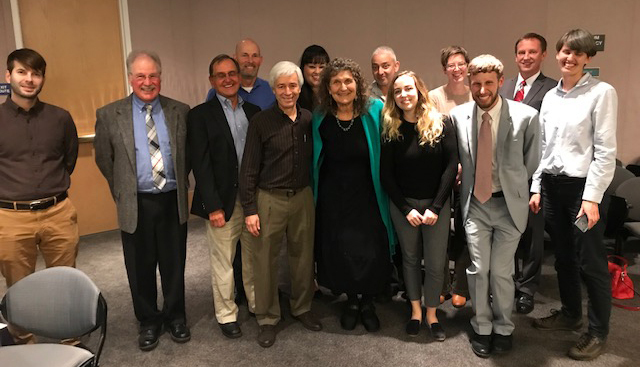 On January 16, Majorie testified at the state capitol in support of code changes alongside a team of toxicologists, public health advocates, combustion scientists, fire protection engineers, fire fighters, construction union leaders, legislators, developers, and architects. Green Science Policy Institute, the lead advocate for this change, has been working toward this victory for more than 10 years. Their 2012 paper, "Flame retardants in building insulation: a case for reevaluating building codes," provided the basis for legislation (California AB-127) and proposals to change building codes to reduce the use of flame retardants in building insulation. With this success, more broad changes at the state and national level will be within reach. Experts testify for code changes to allow insulation without toxic flame retardants. 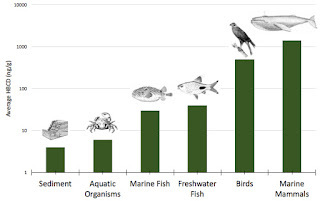 HBCD bioaccumulates up the food chain (Covaci, 2006). Courtesy Green Science Policy Institute.